The gamgyul, or tangerine, is back! If you are feeling down because the summer sun has faded, then you can lift your spirits by going for a walk through some of Jeju’s tangerine fields. The bright orange glow is glorious in the autumn sunshine, and their sweet fragrance is unmist-akable. The gamgyul is one of Jeju’s most famous pro-ducts so this time of year is the best to get your hands on this bountiful crop. From the business side of things, the 2014 Seogwipo International Citrus Pre-Exhibit opened Nov. 14 to 20 and there were various programs and exhibitions across 200 booths to promote the industry. 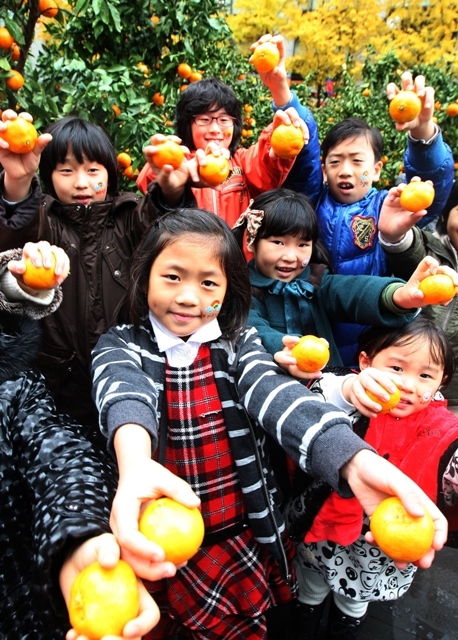 Visitors learned about the industry through the video showing of “Seogwipo's future, the international brand of Jeju citrus,” and the high-tech presentation of 250 types of citrus. Many of these types are grown on Jeju, and each season has a specialty. 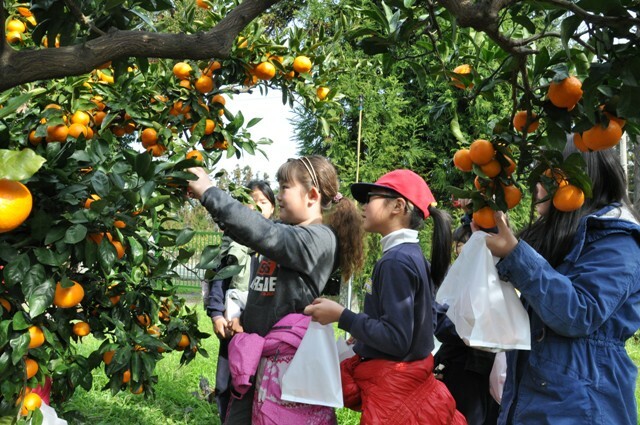 While the “noji gamgyul” is grown in open fields, others like the “Hallabong,” a fat and juicy citrus created especially for Jeju, and “cheonhaehyang,” fragrant and sweet, are grown in greenhouses. Although these varieties are geared toward the tourism market, and are accordingly priced, they are sweeter tasting and more fragrant than regular tangerines. 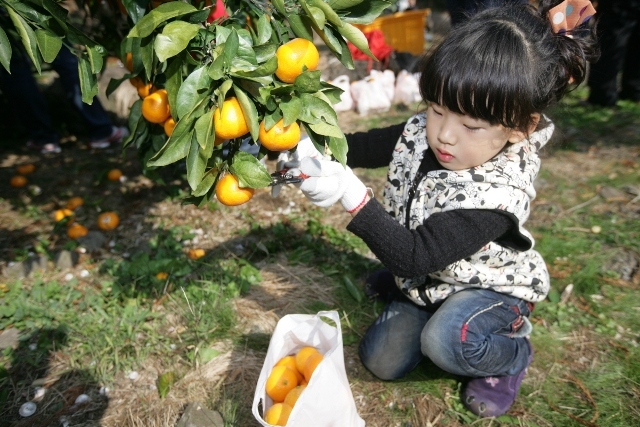 The benefits of tangerines for Jeju people aren’t limited to taste. The industry has been a mainstay of the local economy for generations and fruit sales helped many rural families pay for their children’s education from the 1970s to the 1990s, and even today. Local people even say that people in their 30s and 50s have the crop to thank for their education. However, after prices dropped greatly in 2002, farmers had to diversify. The province even provided subsidies for farmers to reduce the number of acres of the crop to stabilize prices, and many entered the tourism industry with “experience” programs. With such an important role in the island’s economy and culture, it is no surprise that more and more tourists want to get out and experience tangerine picking themselves, and there are many places to do so, often at a low price. If you go, you not only get to eat as much as you want, but you take home whatever you pick. The basic price normally includes 1 or 2 kilograms to take home, with any more being of additional cost. While you might not get enough to pay for your children’s edu-cation, you will at least leave with a full stomach and a bagful of vitamin C to get you through the winter. Covering 4,786 square meters of land and three stories, this is more than just gamgyul picking. Facilities include a themed exhibition room, a 3D video and seminar room, a folklore exhibit, a subtropical garden and more. This is also where the 2014 Seogwipo International Citrus Pre-Exhibit is held. The health benefits of gamgyul are also not to be scoffed at. It is reported that although 86.5 percent of the fruit is water, each 100 grams provides 36 m.g. of vitamin C, 8.2 m.g.of vitamin B1, and 8.2 m.g. of vitamin U, all at just 47 calories. This makes the fruit great for your skin, lethargy, immune system, and even cold prevention. It also helps to prevent hardening of the arteries and hypertension due to its vitamin P content. There is a use for everything in a tangerine according to oriental medicinal tradition. If you burn the peel a blue flame should rise. This is the terebinth oil which reduces cholesterol and prevents artery hardening. Dried peels can also be used for reducing phlegm and coughing, while fresh peel is useful in improving blood circulation and reducing stress. It is recommended that any peel is thoroughly washed in salt water, however, to remove any residual pesticides. Teas are also popular, and are easily prepared by boiling peel in water with some sugar. This is particularly popular for preventing colds in winter. There are endless other recipes using tangerines such as marmalades, jams, and even alcoholic drinks. Tangerines are also added to traditional Korean rice cakes and breads, pancakes, cookies and much more. Not wanting to miss out on all this marketing potential, the province has thus developed a number of souvenir products such as chocolates, teas, soaps, perfumes, etc, all available at gift shops and at the airport. 3. Add pumpkin to the pot with gamgyul juice, ginger juice, water and sugar. Tip: The more peel you use the bitterer the taste so increase or decrease to taste.